A bra-fitting boutique in the city’s Bixby Knolls neighborhood finally reopened Monday following a weeks-long closure due to a rupture in a city main-line pipe that caused sewage to flood into the business. “This has been traumatizing,” Crystal Rogers, owner of Lucy’s Boudoir, said about the flooding and its aftermath. The boutique has been open since 2011 and is known for offering bras in all shapes and sizes that can help with back or feet issues or give comfort to those with wide backs. The business also offers fittings for cup sizes AAA to O.
Rogers said she was first clued in to the pipe problem when her whole store started to smell of “foul sewage” on Oct. 16. She wasn’t the only one who noticed: Employees, customers and even delivery personnel all asked what the smell was. She tried spraying oils but it was no use. The following day, the smell intensified. “Nobody could figure it out,” Rogers said. Rogers said she had to close early Oct. 17 because of the odor. It wasn’t until she received a call that evening to check her store that she discovered it had flooded. Other areas of the building flooded as well. Around the same time, a Baptist church next door had complained to the building manager about low water pressure in the toilets, she said. A plumber tasked with finding the problem couldn’t find issues with the building’s pipes but he thought to check the manhole adjacent to the building on Virginia Road and discovered it had flooded, Rogers said. City workers had recently closed the street to repave it. Lucy’s Boudoir in Bixby Knolls closed for five weeks after it was flooded Oct. 16. Photo courtesy of Crystal Rogers. Sewage water flooded many parts of Lucy’s Boudoir, including fitting areas, offices and stock areas, damaging some of the merchandise. 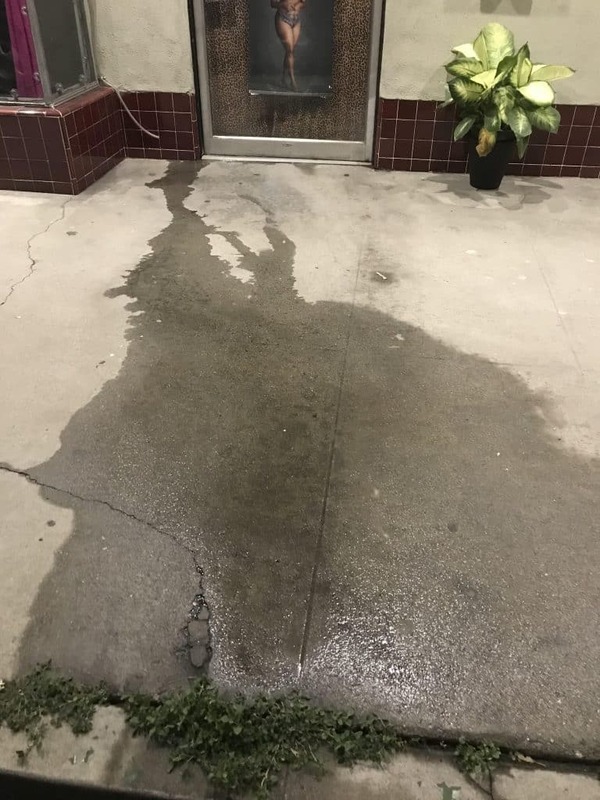 The water was as high as 10 inches in some parts of the space and even went through the walls and streamed out into the sidewalk and street, according to Rogers. The Long Beach Water Department declined to comment on the incident, citing two open claims on the matter still under investigation. Rogers said she can’t estimate how much of a hit her store took but says it not only includes the closure of a business for five weeks but also damaged merchandise, canceled bra parties and the added expense of free shipping and delivery to clients whose merchandise was at the store. She makes anywhere from $45,000 to $55,000 in a given month. She also has to replace a ruined desk, rugs and carpentry. Some of the specialty merchandise, which was purchased last year for the holidays, was damaged too, and the 100-year-old building’s walls had to be opened for asbestos testing. These men are working hard to get Lucy's Boudoir back up and running! Thank you Manning and Frankie for getting the store back together! We look forward to being open Monday!!! Throughout the ordeal, Rogers said she has seen an outpouring of support from customers, fellow small-business owners who offered their spaces for her to work out of and the Bixby Knolls Business Improvement District, headed by Blair Cohn. Cohn said he told Rogers to get the store cleaned and dried right away and then sent links to helpful resources like filing a claim with the city. He also regularly called and checked up on her, Rogers said. “This is where BIDS really show their value,” said Cohn, referring to the business improvement districts scattered throughout the city that act as tools to revitalize commercial corridors. It’s also what Rogers hoped to see from the city. Instead, she said she has received no outreach or assurance from her local council member or any city officials. Rogers said the incident left her traumatized and thinking of starting a support group to help other small business owners in times of need. “That’s what a community is about,” she said. Lucy’s Boudoir owner Crystal Rogers. Courtesy photo. The city’s Economic Development Department is available to help business owners file claims, apply for capital through their financing programs and help with the planning and building permits, according to Economic Development Officer Seyed Jalali. However, he did not mention any outreach efforts currently in place for businesses when disaster strikes. While the whole ordeal has been an eye-opening experience for Rogers, she said she is happy to get back to work. Lucy’s Boudoir is at 3925 Long Beach Blvd. A previous version of this story mistakenly referred to the owner of Lucy’s Boutique as Crystal Jones.